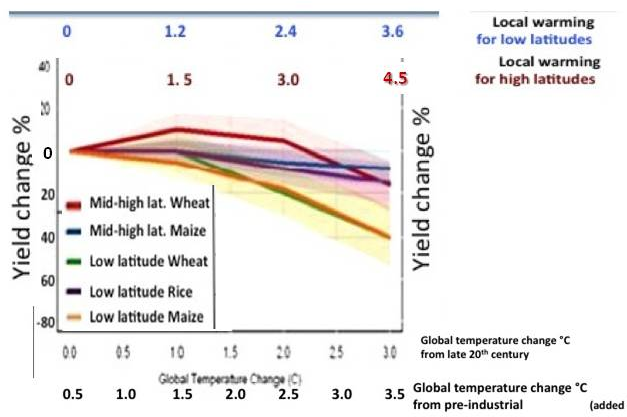 The IPCC in the 2007 assessment results from the climate crop models are given as the percentage in regional crop yield changes associated local temperature changes from year 2000. As climate change policy is assessed in terms of the global average temperature changes from pre 1900 is necessary to make a conversion of the IPCC model results. To convert the IPCC projected temperature changes from year 2000 pre 1900 the IPCC science of working group has a 0.5° C correction. The IPCC says that the climate models do not have adequate resolution for local temperature and climate changes. Nevertheless in the crop model assessment and the temperature changes are recorded as local. The IPCC does not provide equivalent global average temperature changes for these local temperature changes. This is provided by the national research council assessment of 2010. (Stabilization Targets for Atmospheric Greenhouse Gas Concentrations. 2010. Committee on Stabilization Targets for Atmospheric Greenhouse Gas Concentrations. The NRC 2010 Climate Stabilization Targets provides the information we need. ​​For C3 crops, the negative effects of warming are often balanced by positive CO2 effects up to 2-3 °C local warming in temperate regions, after which negative warming effects dominate. Because temperate land areas will warm faster than the global average, this corresponds to roughly 1.25 -2 °C in global average temperature. The graph is from NCR report taken from the IPCC 2007 assessment. The NRC graph provides equivalent global average temperature increase from the late 20th century for low latitude global warming also showing the local warming local warming and high latitude local warming. ​​From this the conversion chart above is derived.